Russian un-issued black polymenr stock for the 100-series AK's and Saigas. 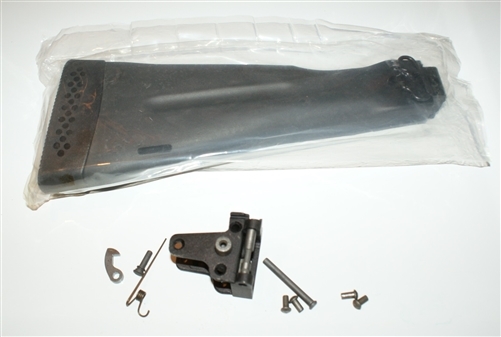 The folding stock is for a 5.5 mm pin. Has the pad that softens the recoil. Allows the stock to lock in the folded position. Made by Izhmash, Russia. Also included a Russian folding stock rear trunion kit for the AK 100 series folder rifles for the 5.5 mm pin. Will work with any stamped squareback AK receiver rifle. 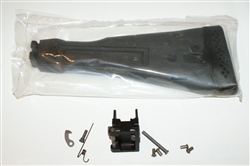 Saiga shotguns require a different stock latch, however all other parts are interchangeable. Made by Izhmash, Russia. All parts are new, un-issued.